Each of us have wished we could master money matters and stop worrying about financial security forever. But for many of us, money remains a bit of a mystery. How can we achieve the financial independence for ourselves and our families that we crave? What if you could get insider advice from 50 of the most famous and successful financial experts alive today? Even better, what if you could access a clear, step-by-step, actionable plan based on all of that amazing advice? You can. Anyone can, because Tony Robbins, the man who has inspired and coached more than 50 million people worldwide, wants you to be able to learn how to master money. He is so convinced that every single person can succeed financially that he wrote Money: Master the Game to provide everyday people with a blueprint for financial freedom. 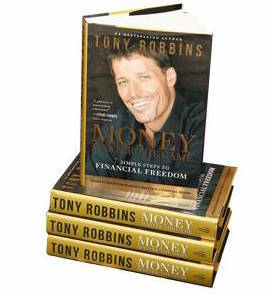 If you are ready to get help clearing the myth-laden cobwebs from your financial vision, let the Tony Robbins money book show you how. Robbins is a master of metaphors and anecdotes that can help you take action in your life, no matter your current financial situation. Don’t let fear and misinformation rob you of their financial dreams. Money: Master the Game was created to seize those dreams of financial freedom with a lifetime income plan. So, why wait any longer? Tony Robbins’ Money: Master the Game delivers the actionable, easy-to-understand advice and best practices you need to make your money mastery a reality. Find Money: Master the Game online here, where all you need to do is pay for shipping and handling.